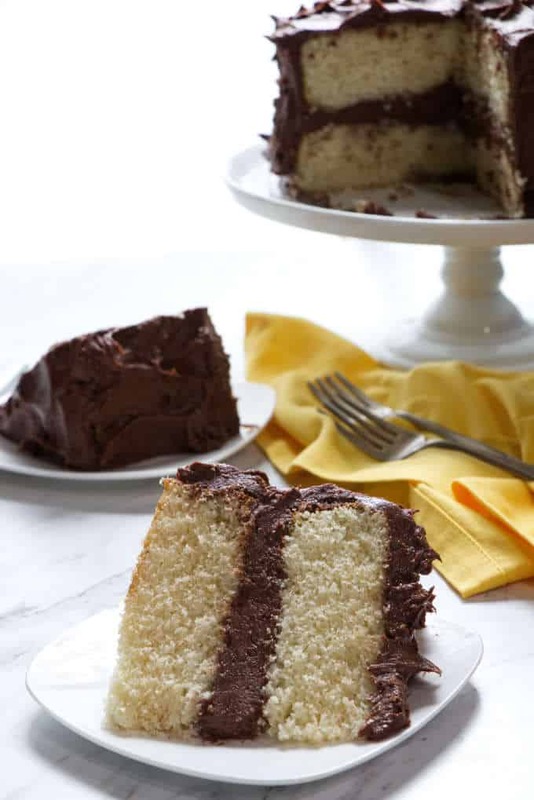 This is an all butter yellow cake with chocolate frosting and it is perfect for any occasion. It’s the kind of cake that you will want to keep on record to make over and over. This yellow cake has a soft, tender texture and a rich buttery flavor. 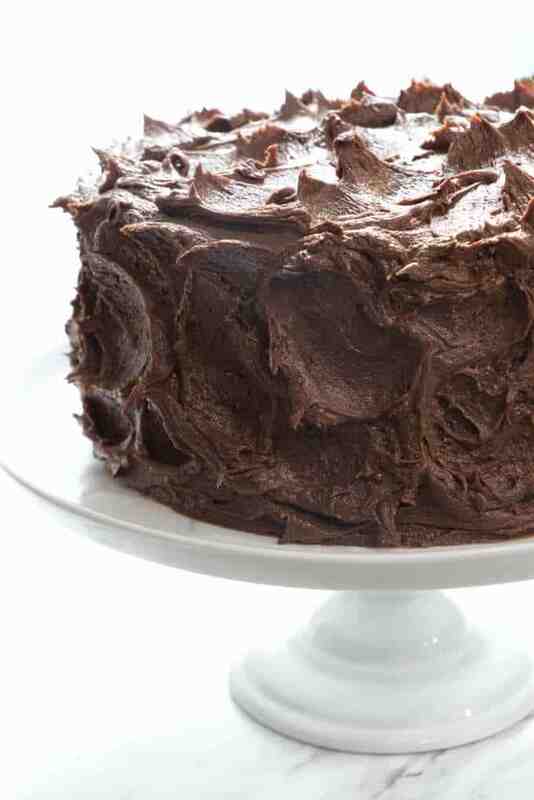 It is all dressed up in a luscious, creamy, smooth, double chocolate cream cheese frosting. Have mercy, someone is going to have to force you to put the fork down. This cake is UH-mazing! 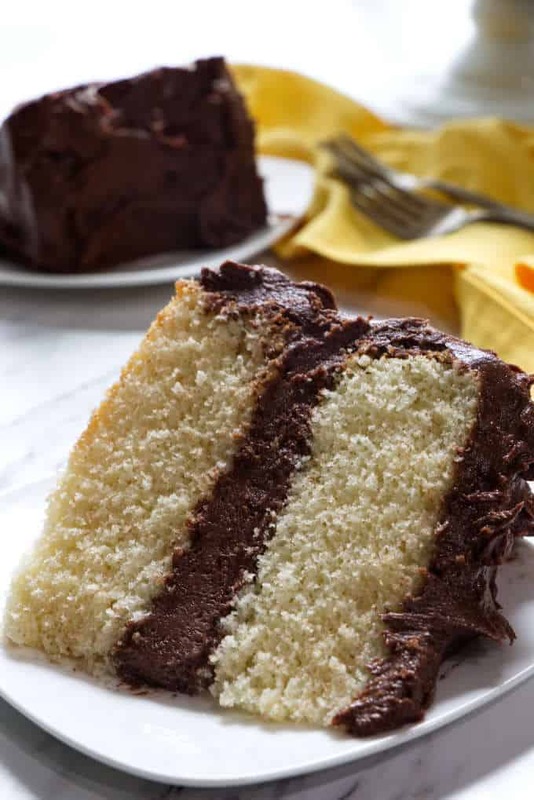 I’m talking rich, butter-lishes yellow cake with chocolate frosting. Not just any chocolate frosting. No, this is double (as in double dose) chocolate cream cheese frosting. You all need this cake. If you are looking for a yellow butter cake, look no more. This is the one. Now I want to get things straight. This is a butter cake. No box mix, no chemicals, no fake flavors, no artificial colors or strange chemical agents. Nope. This is all butter and all natural goodness. So, if you’re looking for the texture and flavor that will replicate a box mix. It’s not gonna happen with this cake. This is a classic, all-butter yellow cake. And it is the best yellow butter cake around. Hands down. The butter gives the cake a little bit of the yellow color but most of the yellowness comes from using all egg yolks. By using all egg yolks, the cake also has a higher fat content which helps create a more tender crumb. 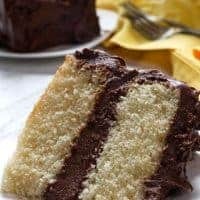 There are a few things you need to know to make this the best yellow cake with chocolate frosting you have ever eaten. I know! Who on earth would ever need help knowing how to eat a cake? 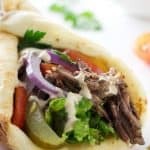 You dive in with your fork, grab a bite and stick it in your mouth. Enjoy. Swallow. Go back for more. And more. And more. But, if you really want to taste all that this cake can be, you need to serve the cake at room temperature. The temperature will affect how a butter cake tastes. Think about what butter is like when you pull it straight out of the fridge. It is hard and cold. This cake is so high in butterfat that the same thing will happen when you pull it out of the fridge. A cold butter cake will be firm, dense, hard and cold. 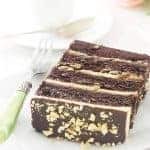 If you let the cake sit at room temperature, the butterfat will soften which will make the cake soft, tender and delicate. It will coat your tongue when you eat it and taste so much better. This is a tip that is frequently overlooked. Butter cakes are better when they are served at room temperature. If you have made our intense chocolate cake then you know how easy it is to make a cake from scratch. That cake does not require any special techniques. Just throw all the ingredients in a bowl, give em a good stir and bake. Heck, it even calls for regular ol’ all-purpose flour. It is hard to mess that cake up. This cake is different. It is not difficult to make but it is easy to mess up if you don’t follow the instructions and use the right ingredients. By right ingredients I mostly mean cake flour. Yes, you can use all-purpose flour in this recipe but cake flour will make it better. Cake flour has a finer texture and has less gluten than all-purpose flour. Both of these qualities lead to a softer, lighter, more delicate cake. 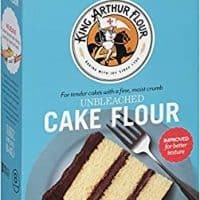 You will notice a difference if you use cake flour. Before you start mixing the cake, set the butter, milk, and egg yolks on the counter. Let them come to room temperature before you begin. Accurately measuring your ingredients goes without saying. But how are you measuring your flour? Flour is the most miss-measured ingredient in baking. If you use a measuring cup to scoop the flour out then the flour gets packed in tightly and you will end up with too much. This is the biggest reason that butter cakes end up heavy, dense, and gummy. If you have a kitchen scale then get it out. I guarantee it is worth using a kitchen scale. I use a digital scale that will measure in grams or ounces. It is indispensable. If you don’t have a kitchen scale then first sift the flour. Once the flour is sifted then very lightly spoon it into the measuring cups. When you add the flour to the batter, don’t mix it too much. That is another cause for a heavy, dense cake. In this recipe, you will only add 1/3 of the flour at a time. Adding the flour in portions will help all the protein molecules get evenly coated in butterfat. But with each addition of the flour, do not overbeat the mixer or you could develop the gluten and make the cake tough. Light metal pans work best for cakes. 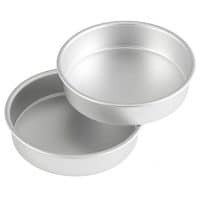 If you use dark metal or glass pans, more heat will be conducted and the outer crust of your cakes will get too dark. You also need to make sure the cake pans are at least 1-1/2 to 2 inches tall. Shallow cake pans are not tall enough to let the cake rise. The recipe calls for two 8-inch pans but you can bake this cake in 9-inch pans if you reduce the bake time by a few minutes. If you put the rack in the center of the oven the cakes will bake more evenly. This is an optional tip but it does make a nice difference in the final outcome. Wrapping the outside of the cake pans with Magi-Cake strips will prevent the edges of the cake from getting too dark. It will also make the cake rise a little bit taller and more evenly. If you want a flatter top to your cake, Cake Strips will help make that happen. 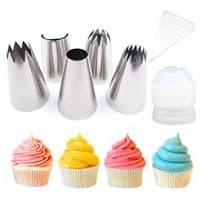 Most recipes will tell you to bake your cakes until a toothpick comes out clean. That is usually when the cake is just a bit overdone and will be dry. If you pull the cakes out when they are still moist enough for a few crumbs to stick to the toothpick, you will have a better cake. The toothpick shouldn’t be wet with batter or completely clean and dry. If you see a few crumbs sticking to the toothpick, you have timed it just right. When you pull them out of the oven, the residual heat will continue to bake them a bit longer. This cake goes well with any flavor frosting. It even goes well with yummy fillings like lemon curd or even fresh fruit. That’s why it is an all-occasion kind of cake. You can adapt it to fit in with any occasion. This time around, we frosted it with a decadent double chocolate cream cheese frosting. The kind of frosting that you’re going to want to lick clean. The kind of frosting that says “take me to a birthday party”. The recipe for the frosting is right below the recipe for the yellow cake. This recipe has been loosely adapted from The Cake Bible by Rose Levy Beranbaum. Rose uses a reverse creaming method in her recipe. If your curious what that looks like then check out our video for our Lavender Cake with Lavender Cream Cheese Frosting. 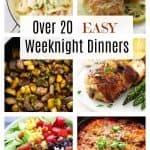 I made this recipe so many times I have lost count. I have switched back and forth between the reverse creaming method and the classic creaming method. That classic creaming method that you probably learned from your grandma or Betty Crocker. I set them side by side. Tasted. Tested. Enlisted taste testers. 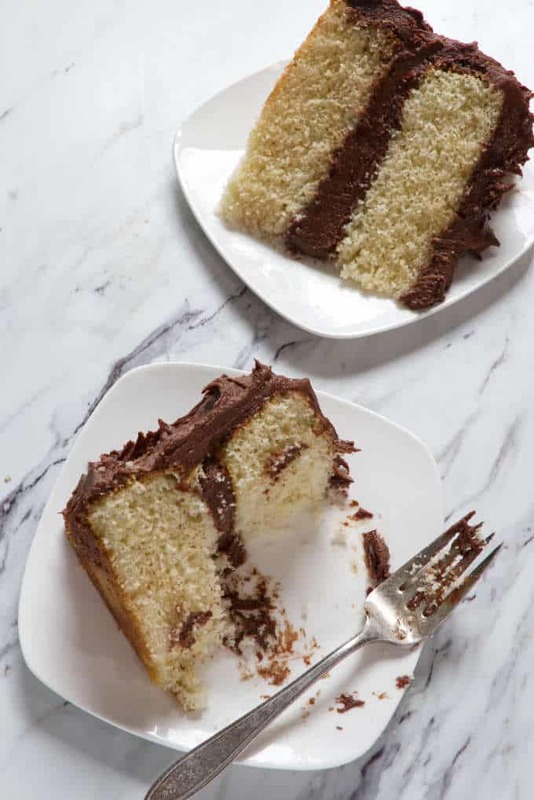 In the end, there was no substantial difference in the taste or texture of the cake whether it was made with the traditional creaming method or the reverse creaming method. There were only a few people that noticed a very slight difference in the sponginess and height of the cakes. 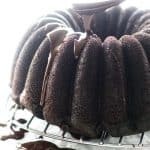 I chose to use the traditional creaming method for this recipe since it seemed to give a slightly higher rise to the cake. I’m talking micrometers, maybe nanometers. But the main reason I chose to use a traditional creaming method is that it is familiar to most people. And I want this cake to feel familiar and easy to make. I want you to feel good about mixing it and baking it. … And eating it. An all butter yellow cake that is tender, light, and delicate. It is filled and frosted with a chocolate frosting that will have you singing. Preheat oven to 350°F. Grease and flour two 8-inch cake pans and line the bottoms with parchment paper. Sift the cake flour, baking powder, and salt in a medium bowl and set aside. In a large mixing bowl beat the butter and sugar on medium high speed for about 4 to 5 minutes until it is light and fluffy. Add half the egg yolks and beat well then add the rest of the egg yolks and beat on medium speed until fully blended. Pour 1/3 of the flour mixture into the butter mixture and mix it on low speed only until incorporated. Next add half of the milk and mix until the milk is blended in. Add another 1/3 of the flour mixture and mix on low speed until it it is just barely incorporated again. Some streaks of flour is fine. Then add the rest of the milk and mix until the milk has been blended in well. Finally add the last 1/3 of the flour mixture and mix on low speed until it is all incorporated. Divide the batter between the two cake pans. Bake for 28 to 33 minutes or until a toothpick inserted in the center comes out with just a few crumbs. Let the cake cool in the pans for 10 to 15 minutes before inverting them onto a cooling rack. If you remove the cakes while they are piping hot, they are more likely to crack. Allow the cakes to cool completely before frosting them. If you stick them in the freezer for 15 to 20 minutes they will be even easier to frost. The nutrition label on this recipe card does not include a calorie count for the frosting, see the recipe card below for the frosting nutrition label. 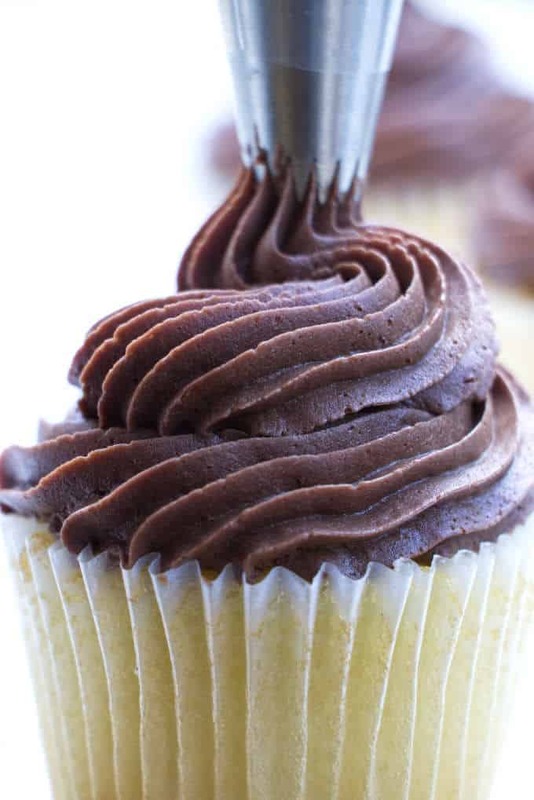 A creamy, smooth chocolate cream cheese frosting with a double dose of chocolate. This frosting pipes well and tastes delicious. Melt the chopped chocolate (or chocolate chips) in a microwave or a double boiler and set aside to come to room temperature while you mix the rest of the ingredients. Place the butter and cream cheese in a medium mixing bowl and beat on medium high speed (with an electric mixer) until it is smooth and creamy. About 2 to 3 minutes. Add the powdered sugar, cocoa powder, vanilla and salt. Stir them in a bit by hand then use the electric mixer to whip it up until it is smooth and creamy. Start on low speed so the dry ingredients don’t fly out of the bowl, then slowly increase the speed. Stop the mixer intermittently to scrape down the sides of the bowl. Pour the melted chocolate into the mixing bowl and beat until it is all blended in and smooth. The butter and cream cheese should be at room temperature and soft to touch. 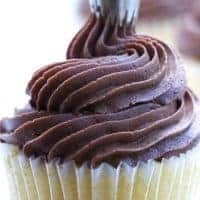 If you use them while they are still cold you will get a lumpy frosting and the melted chocolate will clump up and it will not blend in smoothly. Creaming the butter and cream cheese before adding the rest of the ingredients will also ensure you get a smooth frosting. For best results, you may want to sift the powdered sugar to remove any lumps. Make sure the melted chocolate has come to room temperature before adding it to the frosting. If it is too warm, it will melt the frosting. If you're not a fan of dark chocolate, don’t worry, the rest of the ingredients “tone down” the dark chocolate flavor and make it taste like smooth milk chocolate. You can freeze this frosting for up to 6 months in a well sealed container. I use a re-sealable freezer friendly plastic bag and press the frosting out flat so it stacks well and thaws faster. Let it thaw in the refrigerator overnight, then let it come to room temperature before using it. Room temperature frosting will spread easier. 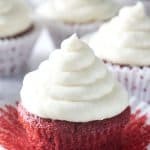 If you want thinner frosting, beat in some water or milk a couple of teaspoons at a time until you get the consistency you want. 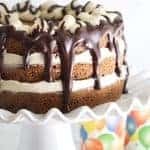 This recipe makes 3 cups of frosting which is enough to generously cover an 8-inch, double layer cake or a 9-inch double layer cake. That is one DEELISH looking cake!!! Can you please post the ingredients for the frosting in grams?? Thank you!! 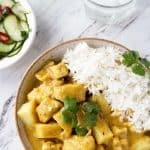 Chandra, I’m happy to add that to the recipe, thanks for the comment. Enjoy the cake.